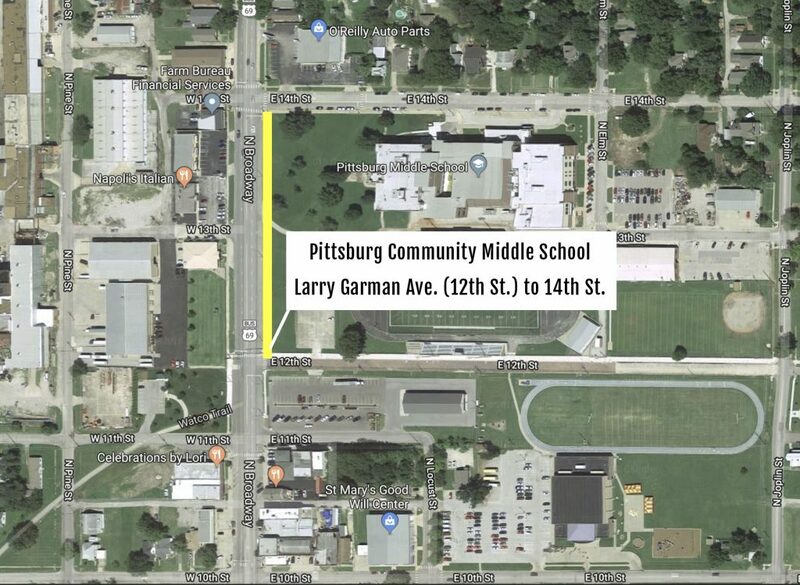 With help from the Kansas Department of Transportation and the national Safe Routes to School program, the City of Pittsburg is moving forward with their Safe Routes to School project. This transportation safety initiative will provide students safer access to area schools. 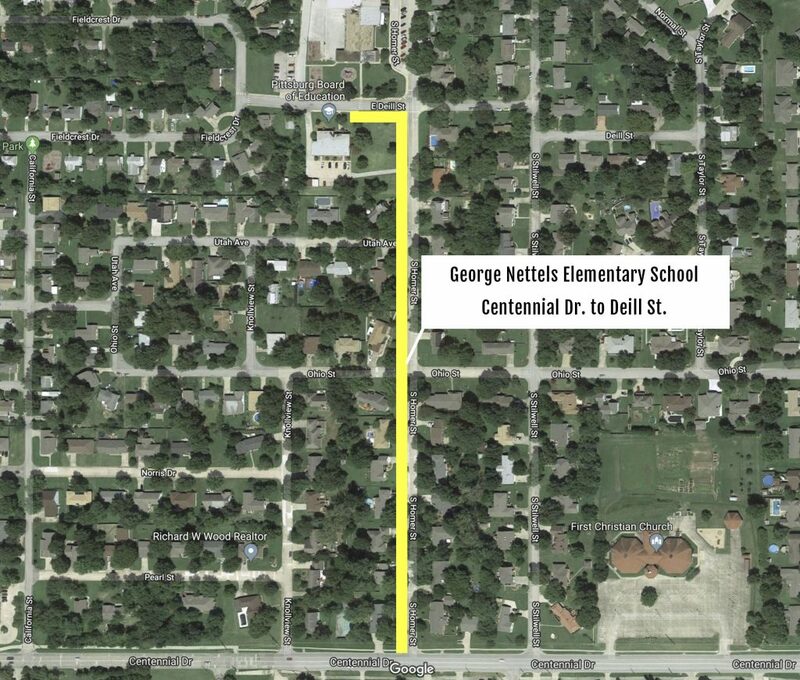 Monday, June 4, crews will begin construction on walking/biking trails to Pittsburg Community Middle School, Westside Elementary School and George Nettels Elementary School. Four years ago, the City reviewed the amount and condition of nearby sidewalks and crosswalks around Pittsburg schools. Through the study, the City identified three schools with the highest need – PCMS, Westside, and George Nettels. 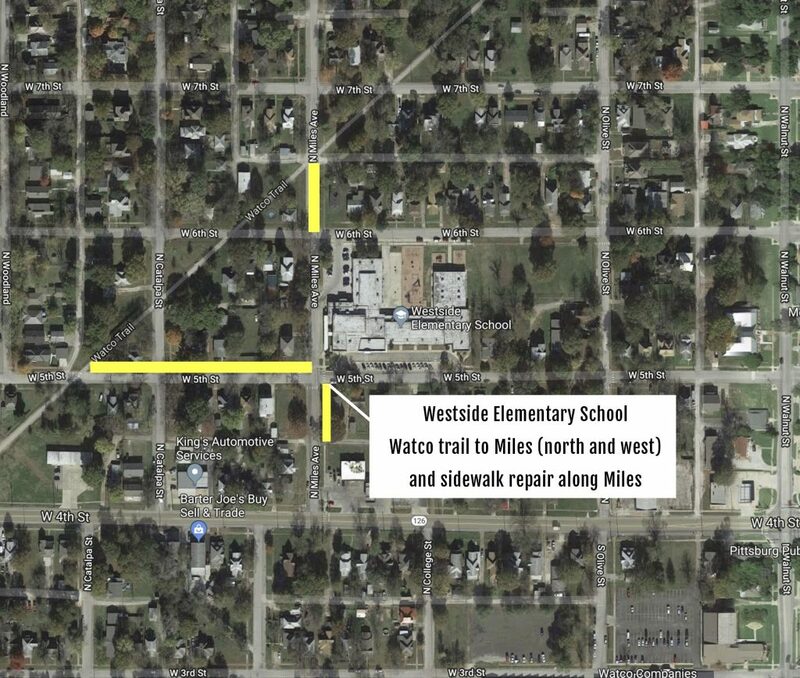 The project will result in a six-foot walkway along Homer St. from Centennial Drive to George Nettels, a 10-foot trail along Broadway in front of the middle school, and a 10-foot trail connecting the Watco Trail to Westside from two separate locations. The City is also repairing a portion of sidewalk extending north to Westside along Miles Ave. The total cost of the project is $240,183, with $187,183 coming from KDOT and $53,000 coming from matching City funds. This project will complement other safety improvements being made along South Rouse St., where another 10-foot trail will be constructed. The trail along Rouse is made possible thanks to another KDOT grant and matching dollars from private donations. Pittsburg City Manager Daron Hall says these projects demonstrate the community’s dedication to improving the quality of life and safety of Pittsburg residents. This week, crews will remove the existing brick sidewalk in front of the middle school to make way for the new 10-foot trail. Construction will then continue at Westside before moving to George Nettels. Ten-foot trail along Broadway in front of the middle school, connecting south to Larry Garman Ave. (12 St.), and the East-West Connector trail to Schlanger Park at 4th St.
Ten-foot trail connecting the Watco Trail to Westside from two separate locations, and sidewalk extending north to Westside along Miles Ave.